Hon. Adongo made an economic revelation last year about Npp who assumed office on 7th January 2017 and started taking credits for economic Prospects of January, February and March while budget had not even been read. This is what happens to a confused government that can't even be saved by fasting, prayers and deliverance. Lot's of people didnot understand Adongo's prophecy until Nana Addo started commissioning projects that had already been commissioned by John Mahama. Exactly what Gen. Buhari, Nana Addo's ''by force'' friend is doing in Nigeria. We were told last week Gen.Buhari commissioned an aircraft for the military that had long been commissioned by Goodluck Jonathan before he exited Aso Rock. I wasn't surprised either when Nana commissioned the Wa water project by linking the achievement to Npp without giving credit to the NDC who initiated and completed the project. Frustrated Ghanaians had to call the President to order after saying the Ceramic factory he recently commissioned which started under John Mahama is part of his One District One Factory Project. I remember a call for Ghanaians to list the numerous project undertaken by the NDC to prevent Nana Addo from claiming ownership. When the President was about visiting his own region we heard the communicators from the Eastern region naming all JMs projects from community to community just to prevent the old man from taken credit for where he did not sow. With the action from these vibrant team from Eastern region Nana Addo could not mention any project to his credit in the Eastern Region. I wonder why while claiming the successes of John Mahama daily without crediting him, would always push the rots they have caused themselves to John Mahama. Typical African Politics! 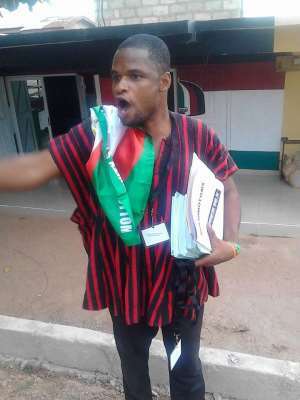 How could you claim and credit yourself of solving Dumsor in Parliament at SONA 2017, and the following day blame John Mahama who had left office for more than a year for not doing well with solving the power crises in the country just because the lights had started going off and your government was blamed? These elephants think they can always play on the intelligence of Ghanaians. Now they always want to attribute their failures to the NDC and John Mahama and find ways to claim the successes of the NDC government. The most recent is the Corruption Perception index by Transparency international which has declared Ghana 81perceived most corrupt country in the world and ranked among the first ten in Africa under Nana Addo's watch. The interesting part is even after the survey numerically enumerated the Presidents frequent interference in corruption investigations, turning the flagstaff house into clearing of corruption cases and declaring suspects clean while investigations are on going as the major causes of Ghana's drop on the ladder just a year after John Mahama made Ghana proud of been one of the rare countries fighting corruption in Africa. The report specifically mentioned Agyarko's 100,000, KENBOND, The two Chief of Staffs, Abronye's claims, Kennedy Agyapong's claim, seat for Cash and many others as the areas that pop up during their survey. But still the Npp said John Mahama is the cause of their woes. Hahahaha...I just couldn't stop laughing after hearing the news, all I could say was that the God of Mahama is alive. Am happy Vitius Azeem was very clear and emphatic to ask that if Ghana had performed better in the Transparency International rating, whether the Npp would've credited the last administration with the result? Am also happy to hear him say this assessment is 2017 assessment with regards to corruption that must be made clear and Mahama's administration has nothing to do with the 2017-18 result. These were the words of the former Executive Director of Transparency International Ghana. No matter how the Npp tries to dodge and make corruption look attractive in their government, Ghanaians will still know the truth that the Npp is trying hard to receive the award of the most corrupt country in the world. I always say corruption can never be ruled out in our human institutions but it takes a leader with courage to fight it. A manifestation is the jailing of Abuga Pele and others today, a prosecution that was initiated by John Mahama government against his own appointee. These and others are the bold and painful decision an Africa President has ever taken. Am still a citizen, not a spectator. B/A REGIONAL YOUTH ORGANIZER HOPEFUL. This author has authored 29 publications on Modern Ghana. Nana Addo To Renovate His House With 9million Dollars?